Home / Construction Safety / Are Fire Extinguishers Required on Construction Sites? In high school and partly in college, I worked helping build residential homes for my parents and others in our home town. Those in charge, always had a fire extinguisher during the building process. After all, construction sites are the perfect source for a Class A fire. While it is a good idea to have a fire extinguisher or water to extinguish any potential fires, I wondered if it is required to have a fire extinguisher on site? So, are Fire Extinguishers required on construction sites? Construction sites are required to have firefighting equipment, such as fire extinguishers, be on site that is clearly and easily accessible in the event of a fire. Whether you opt for a fire extinguisher on site or other means such as water or a hose, Occupational Safety and Health Administration (OSHA) requires that you have the correct type, size and accessibility to extinguish the fires that may occur at a construction site. Let’s look at the OSHA’s guidelines more below. Fire Extinguishers: Portable fire extinguishers are a great option to have at a construction site. Workers will have the ability to quickly grab the fire extinguisher and go to where the fire originates. It is important to note that fire extinguishers need to be inspected and maintained to ensure they work properly. 55-Gallon Open Drum: If you do not want to use a fire extinguisher on site, you are also allowed to use a 55-gallon open drum filled with water along with pails to scoop up the water and take it to the location of the fire. I have never seen this at any of the construction sites that I have worked on. In fact, I can picture a worker taking a bucket for a project and to never bring it back. Garden Hose: Many residential home builders opt for the use of a garden hose over a fire extinguisher or a 55-gallon open drum due to the convince and cost. For some, it is just one less item that they need to maintain and bring to each construction site. Class A Fires (Wood, Paper, Cloths, Trash, etc.) are the most common types of fires to occur at construction sites. Which is why OSHA requires a minimum of a 2A fire extinguisher for every 3,000 square feet of the construction site. However, it is not the only type of fire that may occur. Construction sites that use more than five gallons of flammable or combustible liquids or five gallons of flammable gasses need to use Class B rated fire extinguishers. Construction sites that involve a high amount of electrical equipment or wiring at the site need to use a Class C rated fire extinguisher. Fire extinguishers that are rated for Class A, B and C fires are the most versatile type of fire extinguishers and meet OSHA’s guidelines for fire extinguishers for those respective fires. 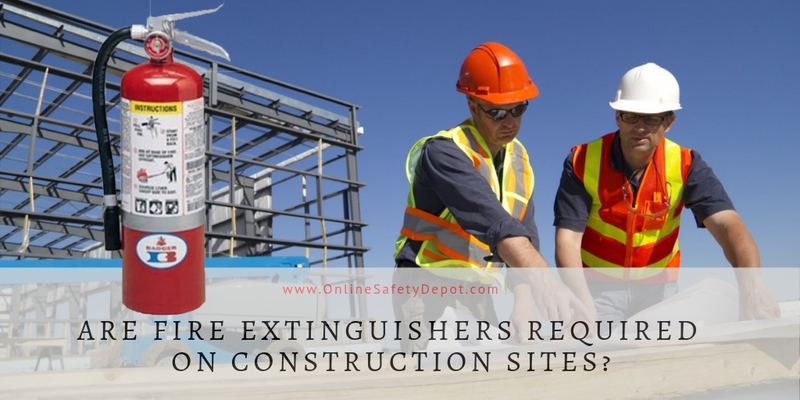 Click HERE to learn more about which type of fire extinguisher you need for your construction site. Portable Fire Extinguishers: Weighing between 2.5 pounds and 30 pounds (agent capacity), portable fire extinguishers are small and designed to hang on a wall or fit in the trunk of a car. They can be used for Class A, B and C fires. Portable Fire Extinguishers are great for smaller fires. Most businesses, homes, workplaces and public places are fitted with portable fire extinguishers due to their ease of use, affordability and portability. To learn more about portable fire extinguishers, read our other article titled, “Understanding Portable Fire Extinguishers – Use and Limitations.”. Wheeled Fire Extinguishers: Weighing between 50 to 350 pounds (agent capacity), wheeled fire extinguishers are designed to combat larger fires. Designed with a well-balanced steel frame and large rubber or steel wheels for easy transport by a single worker through doorways, around corners and into hard to reach places. Depending on the size of extinguisher, it comes with a 25-50 foot hose to extend the reach in extinguishing any Class A, B or C fire. Larger construction sites may want to use wheeled fire extinguishers as they are designed to combat larger fires that may occur. Training: All workers should be trained on how to use a fire extinguisher. There are a lot of training videos and courses offered online. However, I highly recommend contacting your local fire department and seeing what training they may offer. Some fire departments may even allow you to practice with a fire extinguisher and provide you feedback on your performance. The opportunity to practice provides an experience beyond a lecture and will hopefully enhance your use of an extinguisher. If local training is not an option, read our other article on how to use fire extinguishers titled, “How to Operate a Fire Extinguisher”. Inspections: If you are using a fire extinguisher at the job site, ensure that it has been properly maintained by a certified inspector. Not only is this considered good practice, but OSHA requires it. When and how to receive more training. Previous post: Which Public Safety Workers Should Wear High Visibility Reflective Safety Apparel?